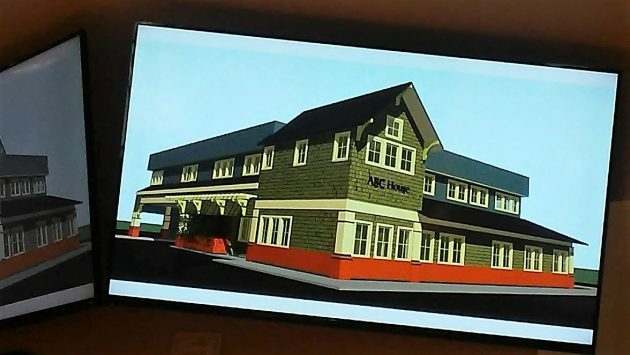 Overhead screens in the city council chamber showed this rendering of the ABC House when it’s finished. CARA is granting the project $10,000. Albany’s downtown renewal board may now be on its way to setting priorities for completing its mission. That’s the vague but hopeful main news from Wednesday’s monthly session of the CARA advisory board. Also Wednesday, the board voted to recommend, and the council acting as the urban renewal agency then unanimously approved, a $10,000 grant to the nonprofit ABC House toward its $3 million-plus renovation of the building it plans to use across Fifth Avenue from the Linn County Courthouse. Regarding CARA’s overall mission, Economic Development Director Seth Sherry, on the job just a few months, got the ball rolling with a review of the 51 projects and activities authorized for the Central Albany Revitalization Area when the council enacted it in 2001. Improvements along the Water Avenue corridor from Monteith Riverpark to Main Street. Acquisition and development of property. Redevelopment of the eastern part of the CARA district, east of Lyon Street. Redevelopment of the Vine Street (Santiam), Eighth Avenue, and Thurston Street canals. Sherry invited the 14-member CARA advisory board to put those categories in priority order, determine their feasibility, acquire the funds for projects within them, and then build those. The board meets only monthly, and when its 14 members (the mayor, six city council members and seven others) will come to a consensus, if ever, is an unanswered question. For much of its 17-year history, the board instead has handled individual requests for grants and loans for restoring old buildings, fixing store fronts, and helping some industries and businesses within the district. It also supported bigger projects, namely Edgewater Village on the river and Woodland Square (renamed Woodwind Square) in the eastern part of CARA. Its most recent effort was the $8 million reconstruction of several downtown streets. CARA better get this thing wrapped up by September 1st or we’re gonna. come down on them like a ton of bricks. Get what part of CARA wrapped up by September 1st? CARA won’t end until 2026, unfortunately for the schools, fire, police who lose taxpayer money to CARA’s whims. Please feel free tell us all how that’s going to go down?